Hope For The Warriors® is an important part of our lives and the lives of military families across the country. Over the years we have looked for ways to contribute our gifts while making a difference in the lives of our heroes—the men and women who have sacrificed while serving in our military. 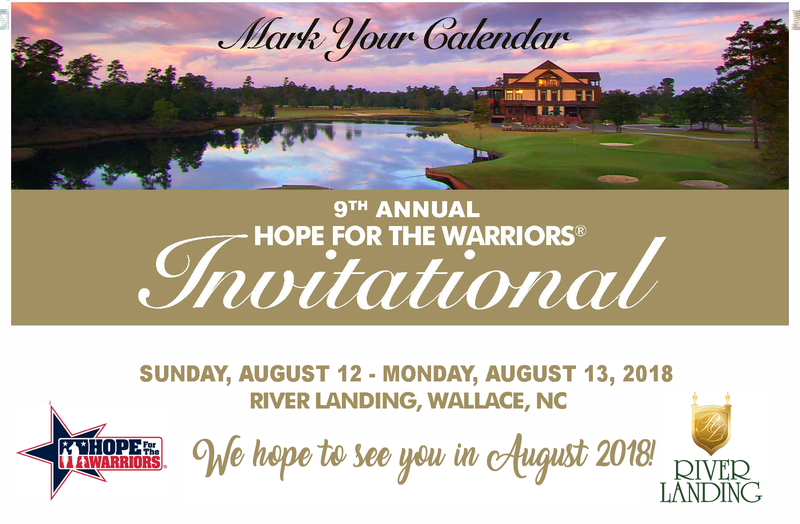 All of us have talents that can be used to enhance the lives of these men, women, and families, so come join us for the Hope For The Warriors Invitational and help make a difference in their lives! We will be spending time with these heroes at the annual Hope For The Warriors Invitational (August 12-13, 2018) at River Landing in Wallace, North Carolina. Our time together will be spent playing golf, attending an always memorable Warrior Night dinner, telling and listening to stories, and honoring our American Heroes! Please join us in using your time, energy, and gifts at the Hope For The Warriors Invitational. You will leave inspired and fulfilled like never before. You will walk away with treasured memories, a stronger commitment to serve these heroes, and a feeling of pride that will inspire other supporters who want to make a difference. We look forward to seeing you at the 2018 Invitational! Please contact Brenna Leger at bleger@hopeforthewarriors.org for more information regarding sponsorship. Please contact Michelle Rademacher at mrademacher@hopeforthewarriors.org for all other Hope For The Warriors Invitational event questions. Join us for this year’s Hope Invitational. You will never hear the Star Spangled Banner again without thinking of these men and women. You will walk away with treasured memories, a stronger commitment to doing more and a feeling of pride that will be contagious to all you come in contact with.